feeding station pole. Another alternative is to provide two bird baths; a main one for the larger birds and a small one for the smaller species. A good bird bath should have a sturdy construction, but make sure that when it comes to cleaning and refilling your task is an easy one. The bird baths featured on this page will satisfy all the above criteria, so rest assured that the birds will be well catered for! Once you have bought your brand spanking new bird bath you need to ask yourself the question,” where shall I put it?” The position of your bird bath is very important. The birds need to feel safe when they use it. Birds enjoy bathing so much that they become preoccupied with it and are thus more vulnerable than at other times. Make sure birds have clear visibility as they bathe, with bushes or trees nearby to provide cover if alarmed. Make sure that cats cannot use the cover to attack bathing birds. You can do this by placing a thick layer of clippings from thorny vegetation, such as rose or pyracantha, beneath the bushes. Experiment with different positions for the bath and try to find the most popular site. The RSPB bronze bird bath is made from lightweight weatherproof resin and has a very attractive bronze finish. It is easy to clean and has a shallow dish for bird safety. It comes in 3 parts and is easy to assemble requiring no tools. This product is supplied with ground pegs as its lightweight structure has a tendency to blow over in strong winds. If you want a very simple bird bath with no fuss and do not want to part with too much of your hard-earned cash then this product may be the one for you. Remember, also, that all the profits of this product go directly to the RSPB to help protect birds and wildlife. The Echo bird bath with stand is one of the best selling designs, which is not surprising when you see its beautiful look. It is made from frost-resistant mottled green glazed terracotta with a quote by the poet William Blake ‘To see a world in a grain of sand and heaven in a wild flower, hold infinity in the palm of your hand and eternity in an hour’ around its unglazed rim. It comes in 2 easy fitting parts – a basin and pedestal. The bath has a ripple step design inside the basin which is not only a very attractive feature but also a functional one as it provides extra grip for wild birds. It is a short bath being only 40 cm high and also has a correspondingly small basin diameter of 30cm. This is more than offset by its wonderful design. The Wednesbury bird bath and sundial is at the premium end of the market and you certainly get what you pay for. It is a great addition to any garden and will look magnificent once put in place. It comes in three parts which the company advises should be bonded together by outside mastic to add further stability. The bath is made of frost-proof cast stone and comes with a wonderful brass sundial making it a stunning focal point in any garden. This quaint bird bath features a number of brightly coloured ducks sheltering under an umbrella. It is made of resin with a bronze-effect finish, comes in at a relatively weighty 12 kg and features a solar powered pump which pumps water to the top of the umbrella and cascades it into the bird bath below, creating a placid atmosphere anywhere in your garden. One drawback with this product is that the manufacturer recommends that the item is stored indoors or inside a garage during frosty weather, or covered with a frost protector. The bath is easy to assemble and the pump works with the slightest direct sunlight, even during the winter period. This is a stupendous looking stone bird bath with a beautiful finish inspired by volcanic rock formations. It is strong and sturdy and comes in at a very weighty 25kg for its moderate height of 2-feet. It comes in two parts, the dish having a nice ceramic finish and is easily put together – the dish has a circular groove which just sits on the base. The bath is weatherproof and frostproof and should last for years as a proud centerpiece in your garden. Rest assured that such a bath has no chance of being knocked over by a strong breeze or even by an excitable dog. 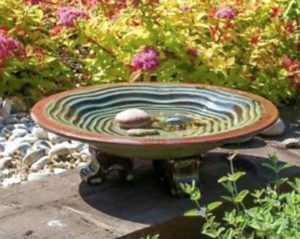 This bird bath incorporates three main features: a shallow bird bath, a planter and a decorative solar light ( switches on at twilight, giving up to eight hours of light.) It is polyurethane based, ultraviolet stabilised, weather-resistant with a classic verdigris finish. Although this is a pretty inexpensive product considering its multi-functionality, a number of purchasers have mentioned that it is tricky to put together. Perhaps you should steer clear if construction puzzles are not to your liking. The bath also needs stabilising with pegs at its base to prevent it from falling over in high winds. Finally, we have the attractive Blue Dipper bird bath, a nice little bath that will look great in very small gardens. The blue ceramic finish is frost-resistant and complements perfectly its natural terracotta rim. Two terracotta landing stones are included with this product but some purchasers note that they are too lightweight and not particularly useful. They are very easily replaced by any stones you may have lying around your garden. Overall, a very attractive little bath that will not break the bank. One of the best things you can provide for the birds in your garden is a clean source of water. Dirty, stagnant water is a definite no-no and not just because of its taste. Dirty water can spread disease to your backyard birds and also has the capacity to attract a variety of pests. It is essential to keep your bird bath as clean as possible. Every time you refill the bath, use a hose pipe on a high-pressure setting to clear away any debris that has accumulated. Position the bath so it is as far away from falling leaves and other debris as possible. Dump out any old stagnant water. Scrub out any debris with a rag. Use a solution of one part chlorine bleach to nine parts water to clean the bath thoroughly. Rinse the bath thoroughly with water until any chlorine smell is gone.